How safe and healthy is your home for your loved ones? No, I’m not talking about security to prevent outsiders from coming in. I’m talking about harmful elements that are already sitting comfortably inside our homes, within our furniture and on the air we breathe. Fabric furniture, like couches, curtains and carpets, can often act as a reservoir for house dust, particularly when family members, guests, and pets carry them into the home. When you sit on the couch, walk on the carpet or fluff up the pillows, you often release the house dust that has settled onto the fabric into the air you breathe. Ambi Pur & Febreze First Defence™ House Dust Reducer features a unique technology that acts as a net that flexes over allergen particles, trapping them on the fabric until they can be removed through routine cleaning and vacuuming. “In Malaysia, our most common allergens in the air that we breathe at home are house dust mites and various animal dander. These allergens may trigger asthmatics symptoms and can force an allergic person to miss work, school and other important activities. Even if the home looks clean on the surface, it’s important to make sure that anything that can release allergens into the air are cleaned regularly”, said Dr. Amir Hamzah Dato’ Abdul Latiff, President of the Malaysian Society of Allergy and Immunology (MSAI). The new Ambi Pur & Febreze First Defense™ House Dust Reducer helps reduce up to 95% of inanimate allergens from pollen, pet dander, and dust mite matter that can become airborne from fabrics. Simply squeeze the easy-to-use trigger and spray on fabrics and carpets until slightly damp. Spray soft surfaces all around your home. The formula uses a unique technology to help keep house dust from becoming airborne and eliminate odours, leaving a fresh scent. “While it’s easy to wash the dust that can accumulate on your clothing, it’s hard to tackle the daily dust from pet dander, and dust mites that become airborne in the home from tough-to-wash fabrics. 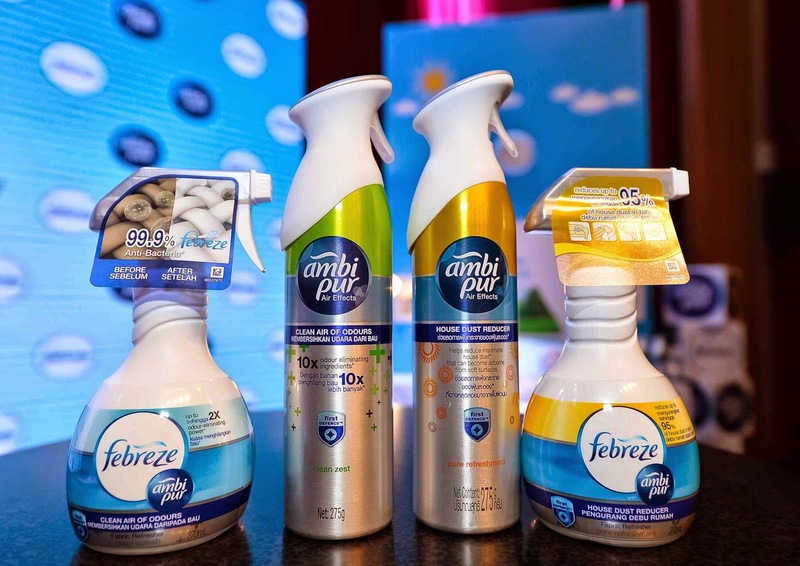 Ambi Pur & Febreze First Defense™ House Dust Reducer was developed to address this issue, to help consumers achieve a deeper clean and healthy living environment” said Goh Seng Jone, Communications Manager, P&G Malaysia. First Defence™ House Dust Reducer is available in both Febreze Fabric Refresher and Ambi Pur Air Effects. Ambi Pur Air Effects House Dust Reducer is available in two light scents, Clean Zest and Clean Splash, at a suggested retail price of RM 17.50. 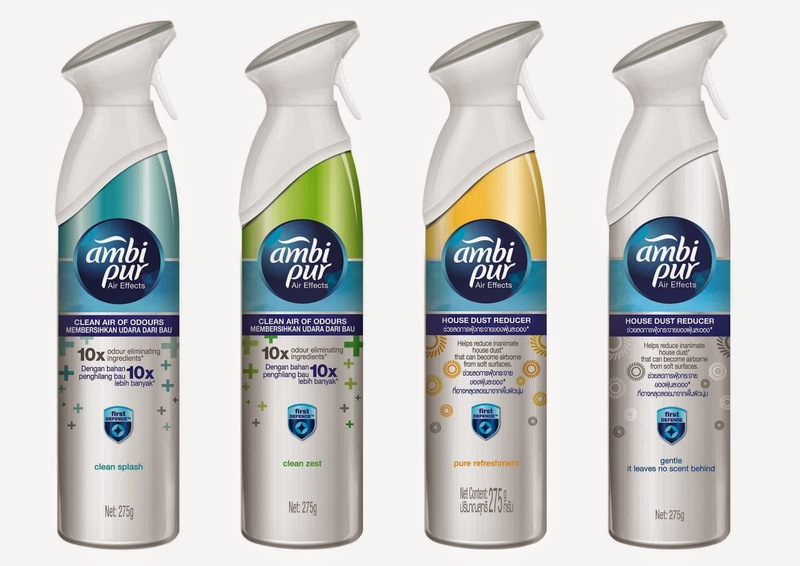 Designed to eliminate house dust and odours in homes, Ambi Pur First Defense Air Effects and Febreze First Defense Fabric Refresher go beyond creating a cleaner living space for families to breathe easier and happier. It makes housekeeping more efficient. With the help of Trap and Lock™ House Dust Reduction technology, inanimate particles such as dust mite, pollen, and pet dander matter that may be present in fabric materials or the air can easily be trapped, avoiding them from becoming airborne when there is an impact to the materials. When Ambi Pur First Defense Air Effects is sprayed to the air above soft fabrics, malodours are trapped and eliminated, while trapping up to 75% of inanimate allergens from becoming airborne. A fine mist of scent is released leaving behind a subtle fragrance that lingers throughout the home. Febreze Fabric Refresher House Dust Reducer comes in Unscented and Pure Refreshment, at a suggested retail price of RM 11.90. Products are available at all leading retail stores. 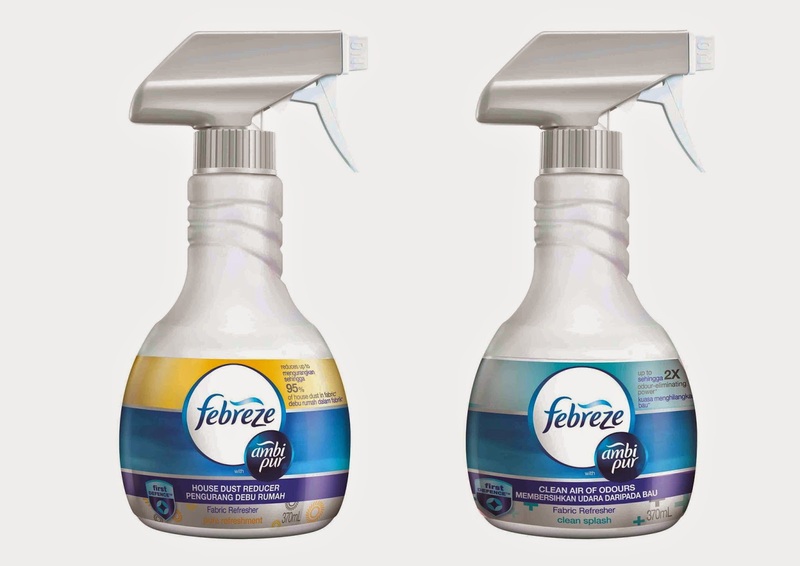 Spraying Febreze First Defense Fabric Refresher on soft fabric can reduce up to 95% of airborne allergens from fabric while still eliminating odors, leaving behind a light, fresh scent. About Procter & Gamble P&G serves approximately 4.6 billion people around the world with its brands. The Company has one of the strongest portfolios of trusted, quality, leadership brands, including Pampers®, Tide®, Ariel®, Always®, Whisper®, Pantene®, Mach3®, Bounty®, Dawn®, Fairy®, Gain®, Charmin®, Downy®, Lenor®, Iams®, Crest®, Oral-B®, Duracell®, Olay®, Head & Shoulders®, Wella®, Gillette®, Braun®, Fusion®, Ace®, Febreze®, Ambi Pur®, SK-II®, and Vicks®. The P&G community includes operations in approximately 75 countries worldwide. Please visit http://www.pg.com for the latest news and in-depth information about P&G and its brand.